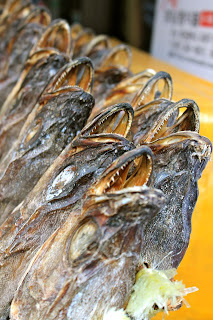 The Jagalchi Fish Market is one of the top tourist attractions in Busan. Tyler and I had heard about the market before we came to Busan and had been curious about it ever since we arrived in Korea. 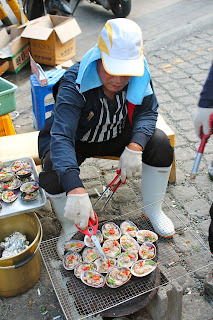 This last weekend, the market hosted the annual Busan Jagalchi Festival, giving us the perfect excuse to go and visit. The moment we stepped foot on Jagalchi grounds, we were overwhelmed with a pungent, fishy odor and a startling panorama of hundreds of dried sea creatures in all colors and shapes. It was certainly a sight to see. Jang Ran, the Japanese teacher at Tyler's school, kindly met us at Jagalchi to give us the grand tour. After we found our way through the winding maze of dried fish stalls, we came to the main walkway where the festival was being held. Dozens of men and women selling seafood lined the path. Tyler eyed giant clams filled with peppers, spices, and other veggies being freshly cooked by a line of men in rubber boots squatting over their culinary creations. Jang Ran kindly bought us a plate that we shared together in a nearby undercover cafeteria. Below are photos of our "cook" and Jang Ran. Before coming to Korea, I would have told you that I wasn't much of a seafood person. If you ever move to Korea, you'll find that your options are to eat seafood or starve. On average, I'd say that 90% of all lunches at my school contain some kind of creature from the ocean. From little fishies to miniature, rubbery, tentacled arms, I've eaten it all (I shouldn't speak so soon, right?). Given that my tastebuds have been accommodated, I have to say that the clams off of the street were pretty delicious. After our snack, we cruised down the street gaping at all of the strange scenes we saw. 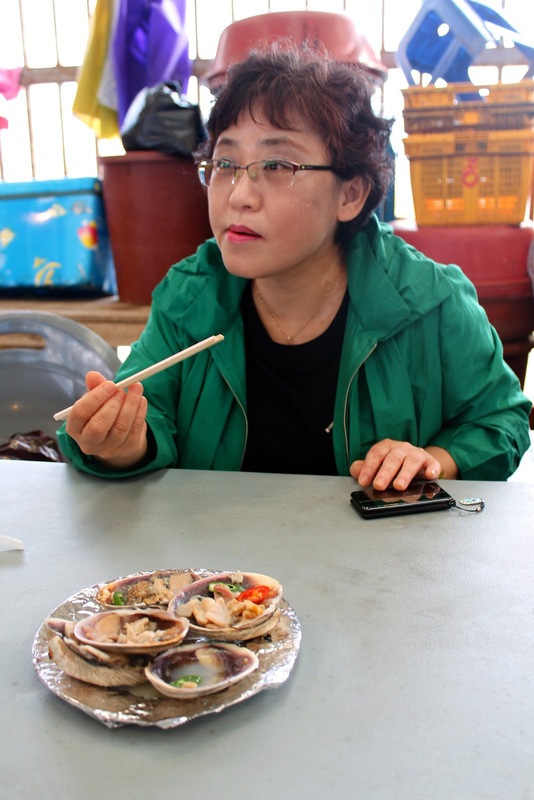 The proud woman in the picture below is showing off the sliced whale meat that she's selling. If you've seen the documentary "The Cove," you'll cringe like I did. Next, Jang Ran led us into the indoor section of the fish market. Not even an aquarium contains such a variety of sea life. I saw creatures there that Lewis Carroll couldn't even have imagined. Tyler and I followed Jang Ran through the aisles of shellfish and soft fish and slimy fish with our mouths open in awe. Below is a photo of Unagi. If you've ever tried Unagi in sushi form, you'll drool every time you hear the word. However, they weren't very appetizing alive and slithering. After we finished gawking at the fish in the indoor market, we found more fish to stare at in the undercover market next to the docking area for the fishing boats. 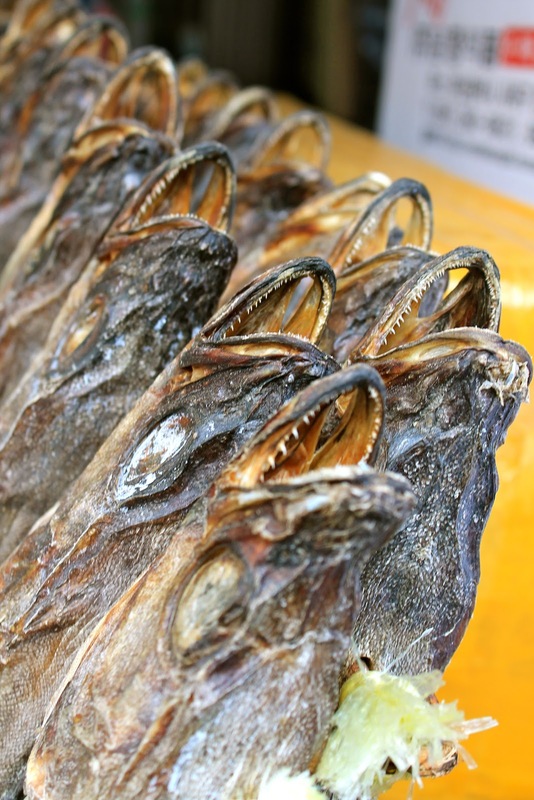 Here, fish were sold on display, spread out in buckets or on large platters. When evening came, we headed back towards the main walkway where the festival was being held. We watched as crazy old Korean men danced away to their hearts' content with the music blasting from the loudspeakers as the hectic motion of the market continued on behind them. Fish sellers were loudly advertising their bounty as Jagalchi ajummas (middle-aged or married women) worked away washing and preparing fish. We talked with Jang Ran about old Korea, what Jagalchi used to be like, and her childhood in front of the harbor. Finally, we settled down on the second floor of the indoor market to enjoy some very, very fresh sushi, Korean style. Our first experience at Jagalchi was exceptionally memorable, although quite shocking and smelly. Nevertheless, we will definitely return another day when we're in the mood too see a fish circus and eat freshly caught seafood. I can even imagine you guys' faces smelling that stinky fishy smell. Though, I miss that smell.